Roaming around Main Street tonight looking for anywhere open after 10pm for a quick bite to eat, we came across Patellini’s New York Style Pizza. We ordered two slices of pizza and an order of garlic knots. I was sadden to see the pizza was reheated pizza so the crust was warm on the bottom, but the cheese and toppings were still cold on top. Plus there was no taste to it. The Garlic Knots were also reheated and also warm on the bottom and cold on the top. The difference between the pizza and the knots was that the knots were amazing! First of all, they are HUGE and secondly, they are delicious! The knots saved the day!!! I didn’t like the marinara sauce that was served with them because it was cold, right out of the fridge cold, and I prefer my sauce warm. Too many cold elements to this meal so I doubt I’ll be back for pizza, but I will get the knots… to go… and heat at home and eat with my own sauce. 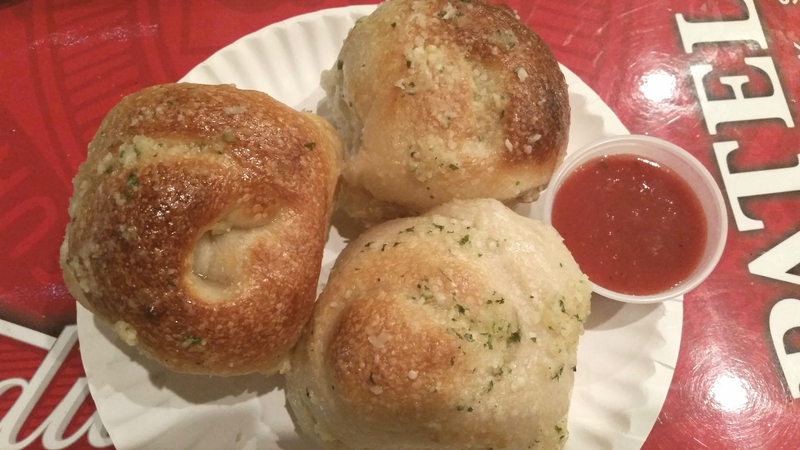 The garlic knots are a must try! The pizza not so much.